Got some new covers. Cover A for issue 19 and cover B for issue 1 of the Tangle and Whisper miniseries "Crisis City, Part 1" Eggman's reign of terror continues! Sonic races to help Team Dark rescue civilians from a major city, but his own Metal Virus infection is getting worse! Outnumbered, how long can Sonic outrun the inevitable? And who else will fall? Tangle & Whisper are a classic odd-couple in this adventurous team-up! Tangle the Lemur's got a problem: there's not enough action in her life! 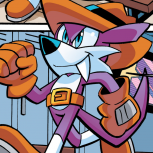 Whisper the Wolf's also got a problem: she's hunting down an incredibly dangerous enemy named Sonic the Hedgehog! Can Tangle and Whisper help each other solve their problems, or will they just make things worse? I found it on ForbiddenPlanet(dot)com while I was looking for RI comics listed, and besides being a new character, I don't know the rest. The Topic of OMG FREE STUFF!? I tend to do these from time to time. 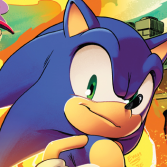 It's a little hobby of mine for editing some stuff among, art and mocking up upcoming Sonic comic covers are a thing I'd like to try and do whenever it is possible before official uploading when motivation kicks in. 15's place holder was one I attempted to do and even if it's not the cleanest from what I've done, it's the best I could create and edit so I'm not sure how it is for anyone's view.